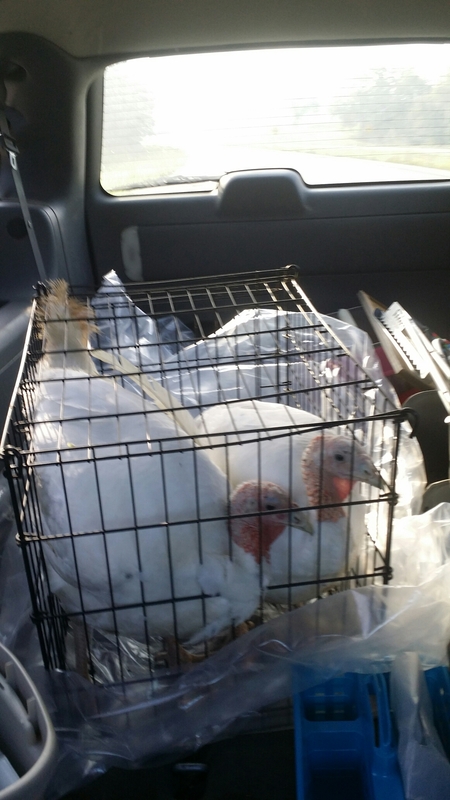 I bought two turkeys from the same little girl I purchased my other white birds from last summer and this summer. She couldn’t take them to the fair (lots of poultry exhibits have been banned right now) so she gave me first dibs on them. I immediately went to see the little Amish lady who processes chickens to see if I could leave them and have them done the next day, but she said I had to bring them back on Saturday (the same Saturday as the estate auction post – we were up at dawn that day to do everything we did). I had to take those birds home. Taking any bird home is a crap shoot, and I am always on the losing end. Ted has this thing for birds. He blames me, but it’s HIM. Remember the two turkeys o bought last summer named Thanksgiving Dinner and Christmas Supper? Christmas Supper died, but Thanksgiving Dinner got a reprieve and is now called Big Mama. Ted said he wouldn’t touch that bird if I served it on Thanksgiving Day. <<>> Remember the ones I got earlier this summer? Nope – he won’t butcher them either. I snuck these new ones home under cover of darkness and put them into the old chicken run to keep them safe from predators. Ted didn’t notice them the two days they were there. Then Saturday morning I casually mentioned while fixing my hair that we had to drop the two new turkeys off to be processed. He was not happy, but he didn’t put up too much of a fight on it. He made comments all the way there, but we left them at the Amish farm and left to take the fostered puppy to her new family. We picked them up in the cooler after the estate sale, and I set them in the garage fridge to firm the meat up before cooking. I decided to do the trial Thanksgiving run on Monday since I was working at home all day anyway. I’m not going to lie. 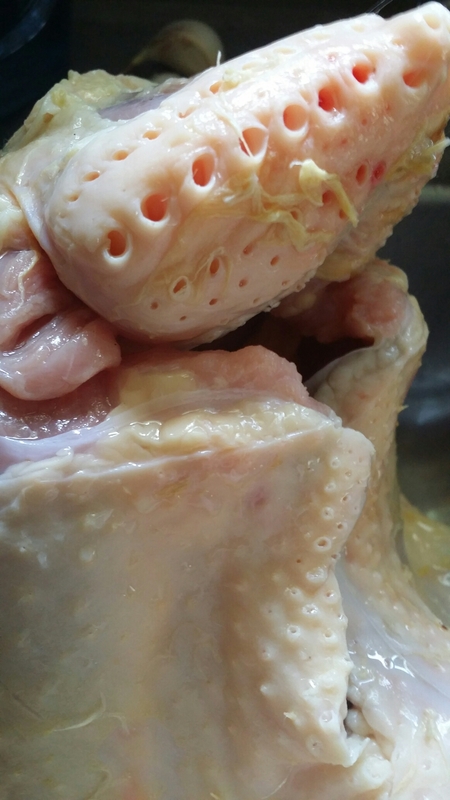 Those raw turkeys did NOT look like grocery store turkeys. 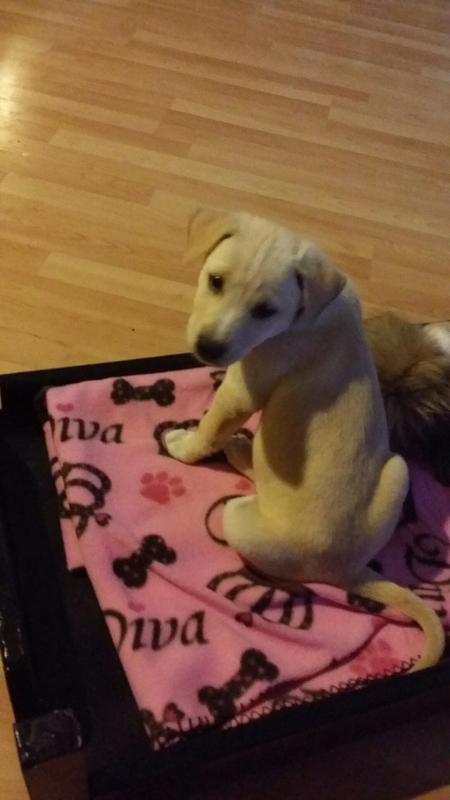 For one thing, they each weighed in at seventeen and a half pounds. There’s not much fat on them so I guess what you see when they’re walking around is what you get when they’re ready to cook, minus the head and the feet. For another thing, the wing feather holes looked like elbow macaroni. I’m not even kidding. I took pictures because I knew no one would believe me. Also, there was no flap of skin there to tuck the legs into to keep them together. 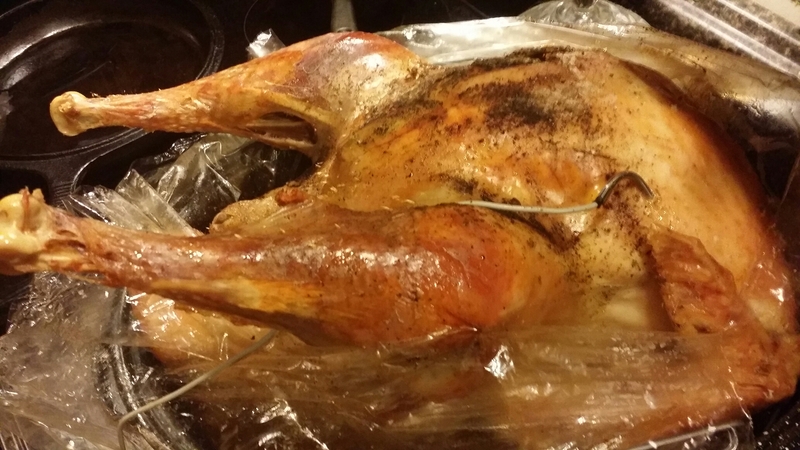 It sure did look huge in the roasting pan (in a Reynolds turkey bag). It was huge. It took up the entire oven! I had to use my crockpot to make sweet potatoes, corn, green beans, and stuffing. It smelled delicious cooking though, and it browned up so well!!! Next time, I’ll tie the legs together while channeling my inner Martha Stewart. The other one is going into the freezer for Thanksgiving. I’m so happy I did this. 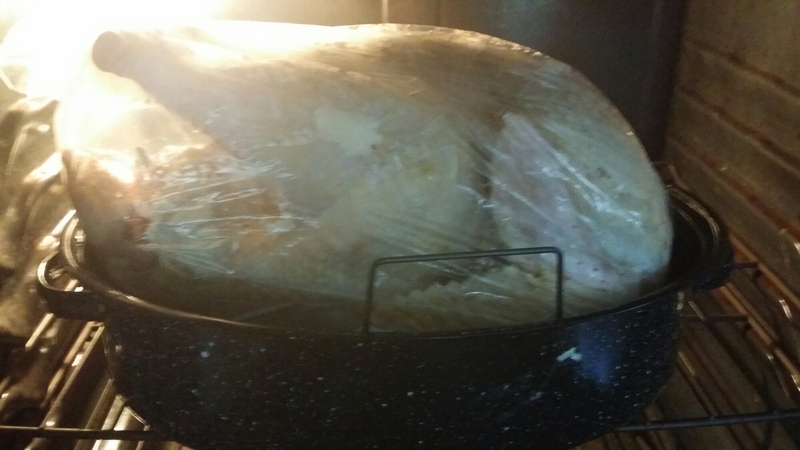 I would never sell something from my farm that I’ve not taste tested myself, and now I know from first hand experience the tips to give to others when they’re cooking one of our farm fresh turkeys. I feel confident in raising and selling turkeys from our farm now (with the processing done by the little Amish lady). It’s one more local fresh item I can offer to folks around here who want to know their food has lived a good life and just had one bad moment at the end. Now we just have to figure out how to finish seventeen pounds of leftover turkey…plus all the sweet potatoes and stuffing I made to go with it. I may not have to cook again all week! ← Estate auction – woohoo!!! 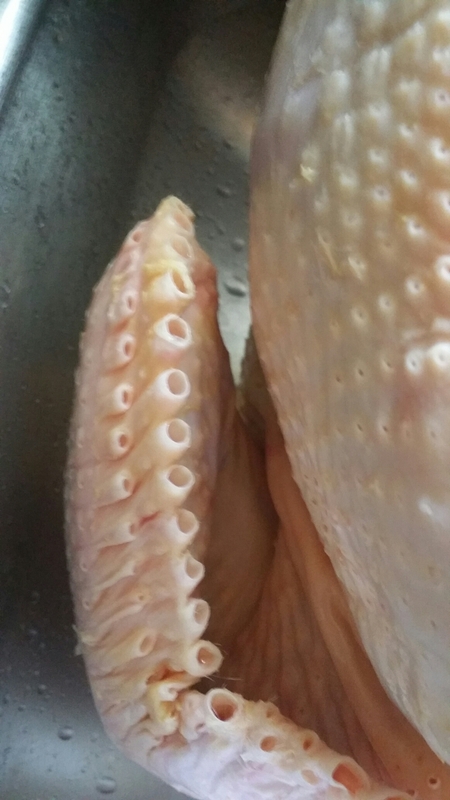 No, you were not kidding; the wing feather holes DO look like shell macaroni!